Wedding cakes are certainly the ultimate in cake, and we love working with you and your ideas to create something breathtaking for your day. 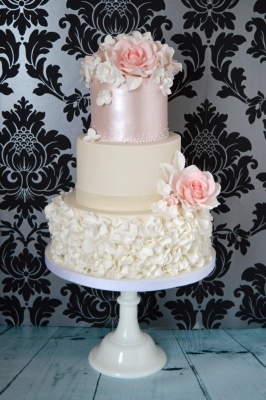 Just a few examples of our Wedding Cakes below. For a many, many more examples of our work please visit our Flickr gallery. 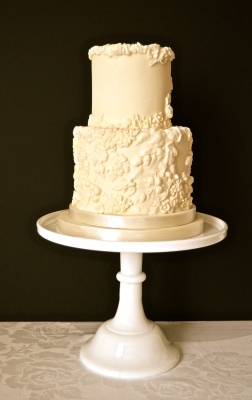 Your wedding cake is probably the most important (and expensive) cake you will ever buy. It therefore needs to be exceptional. We believe that all of our cakes should taste as exqusite as they look, and go to great lengths to create recipes and techniques to ensure that your cake will delight the most discerning of your guests. 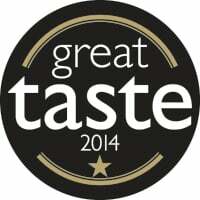 We have won 5 Great Taste Gold awards to support this. 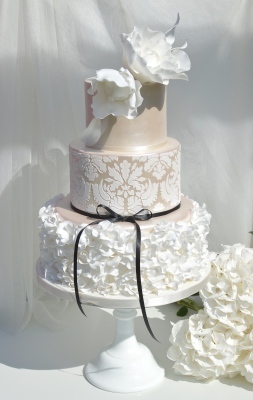 We love all styles of wedding cake, from the very traditional Lambeth piped cakes to the very modern lustred or metallic cakes. We have even made wedding cakes which look like cars, or football mascots. 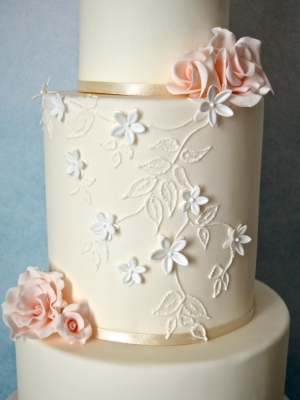 We love to include elements from your wedding, such as replicating the lace from your dress onto the cake, or re-creating the flowers from your bouquet in sugar - things which make the cake truly personal. Pretty much anything is possible - let us know your wildest dreams. Whilst we will always do our very best to help out with later orders, date reservations are best made 6-12 months in advance (especially for spring/summer weddings). A deposit of £60 is asked to reserve the date. Detailed design consultation is best planned after the venue, dress, flowers etc are arranged so that your cake can complement these. 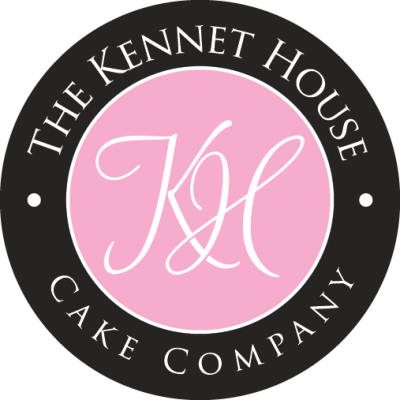 When you are ready to design your cake, we invite you to Kennet House to sample our cakes and design your cake in collaboration with us. Please bring along any elements of the wedding that you would like to reflect in the cake - possibly fabric swatches from your dress, colour themes, flower details or photographs of the venue. 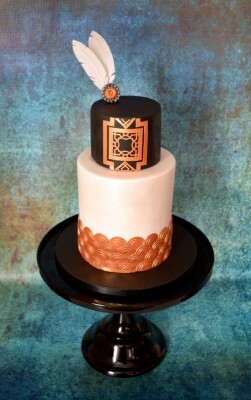 Each cake is unique and the price will vary according to the complexity of design (and the size of the cake!). 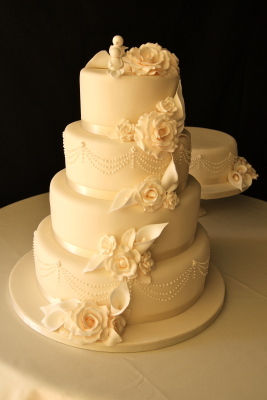 As a starting point, three tier cakes start from £300; four tier cakes from £400. A final price will be confirmed following the detailed design. A final invoice will be submitted for payment two weeks before collection/delivery. 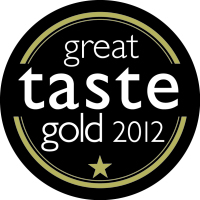 Delivery and set up is charged at £25 within 20 miles (and at an additional 45p/mile outside this). Alternatively you may like to collect your cake. We will liaise directly with your venue to arrange delivery of the cake and ensure that a cake table, cake stand, knife etc are arranged. 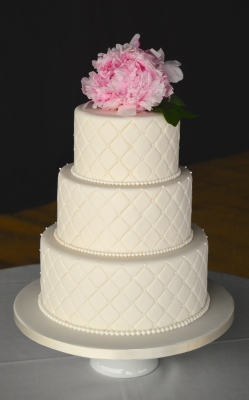 Fresh flowers are a beautiful way to dress a cake. We are able to source edible, organic flowers for your cake, or are very happy to liaise directly with your florist to make arrangements decorating your cake with their flowers. We are not a nut-free kitchen; however our wedding cake recipes do not use nuts and we can omit marzipan from our fruit cake covering on request. We can create dairy free, gluten free and vegan cakes - however including these can affect the structure & design of the cake so we would talk through these choices with you. Very pleased to see our designs in Wedding Cakes magazine once again - well worth a look for inspiration when you're considering cake styles for your day.